Joint Action: What is Shared? 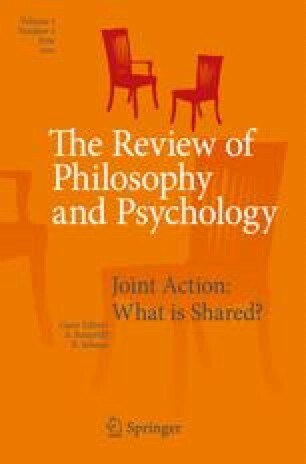 This paper examines the idea of an extended unit of action, which is the idea that the reasons for or against an individual action can depend on the qualities of a larger pattern of action of which it is a part. One concept of joint action is that the unit of action can be extended in this sense. But the idea of an extended unit of action is surprisingly minimal in its commitments. The paper argues for this conclusion by examining uses of the idea of an extended unit of action in four theoretical contexts. It also explains why the idea of an extended unit of action need not involve magical thinking, and discusses possible replies to an objection based on a worry about recklessness. I am very grateful to the late Susan Hurley, the late Michael Bacharach, and Alex Gregory for very helpful discussion of these issues. I am especially grateful to three anonymous referees and to Stephen Butterfill and Natalie Sebanz, all of whose extremely useful and generous comments helped me greatly improve this paper.